Kids love to experiment and build. That’s why STEM activities are always so popular. 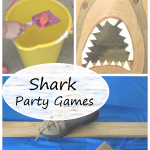 They give kids a chance to get creative and explore. 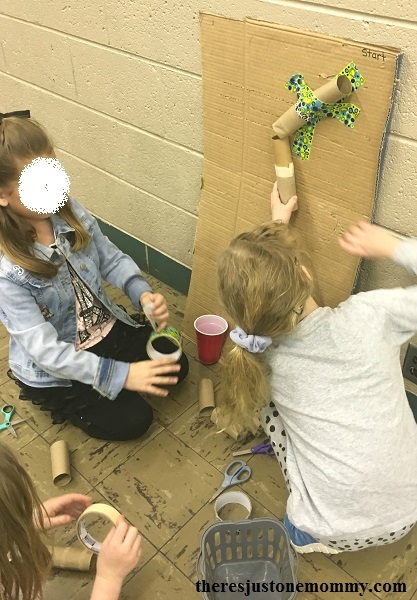 Making a marble run with cardboard tubes is an inexpensive hands-on learning activity your child will love. We had lots of fun creating marble runs as part of the Inventor’s badge for Brownie Girl Scouts. We look forward to experimenting with them more in the future. Creating a cardboard tube marble run would be a fun rainy day activity. Secure the plastic cup to the bottom of your cardboard. I used a bit of hot glue to do this, but you can also use duct tape. If desired, label an area at the top of the board as start. This is where the marble run should begin. 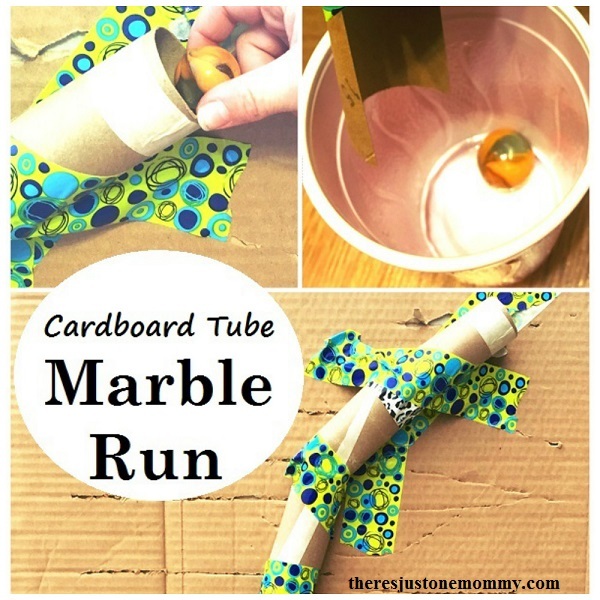 Challenge your child to use the cardboard tubes to get the marble from “start” and into the plastic cup. It’s important to experiment and test each section that is added. Are the marbles flying off the end? Try positioning the tubes differently. Are they getting stuck? Try tilting the tubes downward more. Trial and error is all part of the engineering process. Using masking tape when first positioning the tubes makes it easier to move them if needed. Once they are in place secure them with duct tape, which holds them better when running marbles through the tubes over and over again. Cardboard tubes can be cut at angles, made shorter, or even cut in half length-wise. 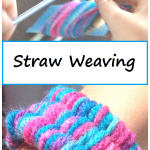 Challenge your child to experiment with what works best. Cut all the tubes in half length-wise so they are open. This will increase the challenge. 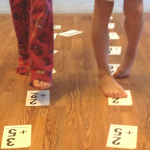 Have your child make 2 paths to the cup instead of just 1. Use a stopwatch to time how long it takes the marble to land in the cup. Challenge your child to create a new marble run which is faster. Those Legos aren’t just decorating the floor; they’re there for a reason. Kids need the opportunity to be creative and build. 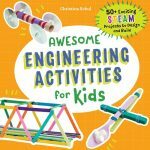 Stem activities like making a marble run give them a chance to do just that. I should do something like this with my kids. We went to the science museum today and they loved a wall that was similar to this. Great idea! I bet they’d love it. 🙂 And, since it’s just cardboard tubes, you can always take it apart and rebuild it different ways.